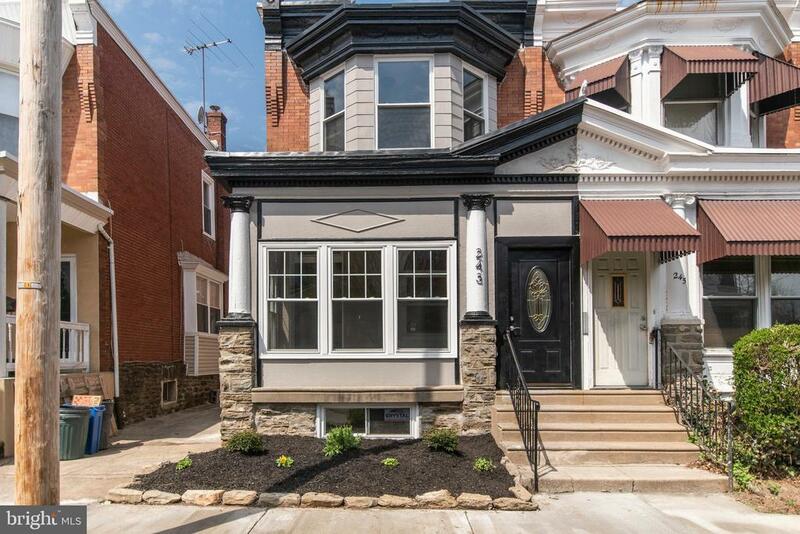 Situated on a quiet block, 243 E Durham is a beautifully renovated home. So much original charm including a turned staircase, stained glass windows, skylight, hardwood floors, 2 gas fireplaces, gorgeous trim, exposed brick, original doors and crystal doorknobs...Very walkable location both to Germantown Ave. and Chestnut Hills Saturday farmers market. The train station is at the end of the block and is 20 minutes to Center City. Walk to Mt. Airy playground and Lovett Library, Weavers Way coop and Fairmount Park. With almost 1800 square feet, this house has a first floor powder room and laundry. Carrara marble counter tops and herringbone backsplash, slate floors and white shaker cabinets in the kitchen. Full basement with high ceilings - perfect for finishing for even more space. The master bedroom has cathedral ceilings with exposed brick and steel beam, lots of gorgeous light stream in through the bay windows. Luxurious master en suite bath, gas fireplace and 2 closets. The upstairs hallway has 2 closets for linens and off-season clothes. The other 2 bedrooms are large and the hall bath has a refurbished claw foot tub with shower and charming tile. Enjoy a BBQ or morning coffee in the quiet, private back patio or walk to the restaurants on Germantown Ave. New HVAC with Central Air, new electric, new windows and a new roof - this home really does have it all! Welcome home to 243 East Durham Street!